Is there an Alfred command to directly go to the Snippets preferences. I can use Alfred to go to the Alfred Preferences, but that takes me to the Default Results. I want to go to the Snippets prefs. Thought I would check back on this. Any help is appreciated. No, it's not possible. 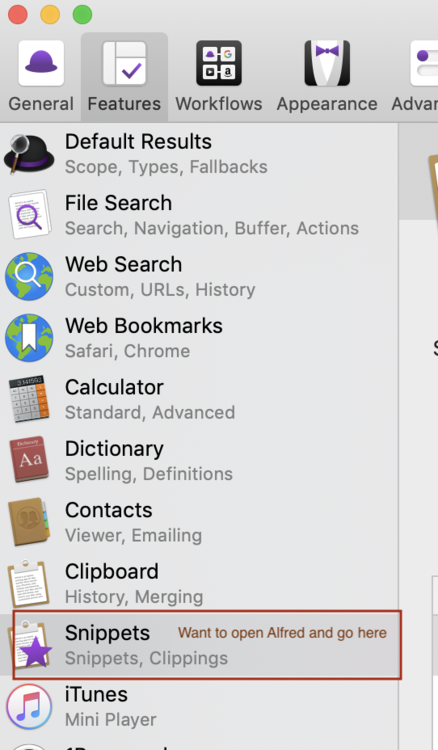 Alfred Preferences always shows the default view of the tab you last selected. How do I make this a feature request? Post it in the Alfred Feature Suggestions forum.